It’s good to learn more about appliance repairs. I don’t trust myself to repair our fridge myself, but I still think we don’t need to replace it. I think we’ll hire a professional to come and look at the cooling part of the appliance. Refrigerators malfunctions are most often parts that are easily identified and easily replaced. Problems with the defrost system can look like a cooling system problem when ice insulates the cooling coil in the freezer section. Replacing a compressor, cooling coil, or Freon are jobs I recommend leaving to the professional repair tech with the right equipment and training, but 95% of what goes wrong with a refrigerator or freezer can be successfully repaired by the appliance owner with a little free assistance from U-FIX-IT Appliance Parts. Thank you for your comment. I would not clean the glow plug. Nothing good is going to happen. 1. Cleaning the flame sensor, 2. making certain the flame impinges on the flame sensor, and 3.confirming the control board has a good ground will often cure the symptom you have. Look for a sticker on the board or on the furnace door that explains what different flashing light sequences are indicating. They can be very helpful in identifying a specific malfunction. Feel free to call the nearest U-FIX-IT Appliance Parts store for free personalized diagnosis assistance. We will contact you to see how might help. Thank you for your inquiry. 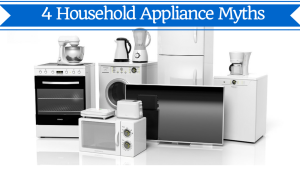 Thanks for the advice on household appliances and understanding what is and what is not a myth. I had always thought that the bigger the system, the cooler your home would be; however, I guess that is not always the case. My wife and I were thinking about upgrading our system, but now might just repair it instead. Thanks again! You are exactly right. Size is not the only factor. Humidity removal is just as important as cold air and it takes time of the system running to remove it. You may want to have a heat load calculation done on your home, if you suspect your system is not sized correctly. In your article, you stated that the seals around a dishwasher’s door are meant to perform in damp conditions, and the material dries out if you don’t run any loads for several weeks and you should trust the mechanical muscle in your appliances, and let them flex on a regular basis. When I went to do the dishes this morning I noticed that our dishwasher was not starting and I didn’t know what was wrong. I wonder if there are some dishwashers that might need maintenance more often. It has been my experience that appliances perform better and last longer when they are used regularly. Yes,some appliances can need more maintenance than others, but it usually has more to do with how they are being used. A child standing on a dishwasher door for example. The range of performance from the best to the worst is fairly narrow. Thanks for busting the oven myth. I accidentally found ufixit. Glad I did.. My furnace blower was continually running putting out cold air. I easily found both the glow plug and the flame sensor and cleaned both (after turning off power to unit of course). As you suggested, I used a mild.abrasive..Scotchbrite pad..worked great! !The parts were not awfully dirty so it doesn’t take gobs of soot, etc to cause malfunctions. Thanks for your US service and America, Bless God! !